Buying a large prelighted artificial Christmas tree has just become a heck of alot easier. Christmastopia.com has simplified the process for anyone looking to purchase a large Christmas tree for the home or commercial use. Team Santa Inc. suggests that you are not impulsive about purchasing a large artificial Christmas tree. It’s always a good idea to study all of your options, do your homework and look at the selection of Giant Christmas trees from more than one website. Christmastopia.com has a comprehensive collection of lit and unlit giant artificial Christmas trees starting at 10 feet and go all the way up to 40 feet. The Christmastopia.com website has over 1000 natural looking fake Christmas trees. Available in both prelighted with LED lights or unlit. You can have it your way at Christmastopia.com. 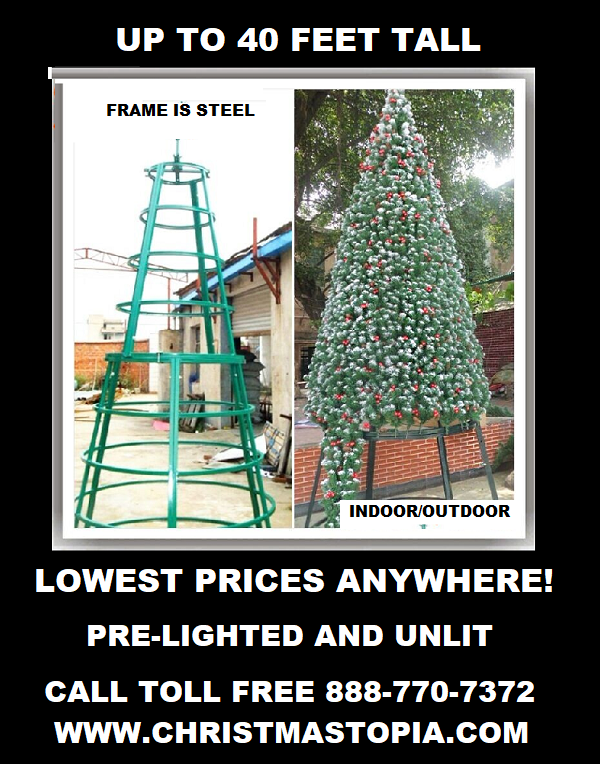 Plus our prices cannot be beat on BIG Artificial Christmas trees. Team Santa Inc. offers a price match guarantee to products of the same sold elsewhere. Additionally, Team Santa Inc. is happy to work with you on the price, delivery, etc. The Team Santa Inc. General Manager Sam Bartolo is always pleased to show you the latest and the greatest when it comes to realistic looking high quality artificial Christmas trees. Please remember that Team Santa Inc. offers the buyer of the tree a 100 percent satisfaction guaranteed or your money back.‎ The best time to buy a big artificial Christmas tree is now!